Come March and we can't keep calm for Holi. This year, 2019 will see Holi celebrated after Holika Dahan on March 20, also known as Choti Holi. On 21st Indians will observe the rangwali Holi. While predominantly, Holi is a Hindu festival, the festival of colour and love is also celebrated by people from various backgrounds. However, the most important part of Holi is playing with colours and smearing each other's face until all of us become unrecognisable. While it is a lot of fun, the colours are made up of harmful chemicals that tend to impact the skin and hair adversely. The chemicals in artificial colours are harmful and cause various problems like skin disorders, discolouration, contact dermatitis, abrasion, irritation, itching, and dryness. 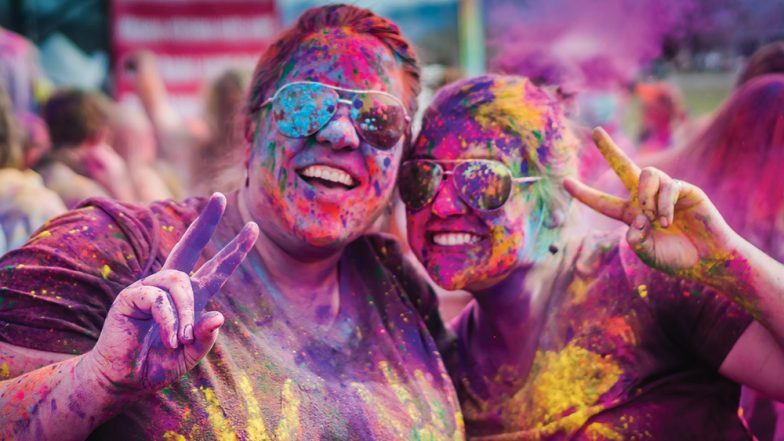 Harsh chemicals in Holi colours can also cause itching and rashes that can lead to eczemas upon scratching, which is the most common type of skin reaction. Holika Dahan Images & HD Wallpapers for Free Download Online: Wish Happy Holi 2019 With WhatsApp Stickers & Beautiful GIF Greeting Messages. Dr R K Joshi, Senior Consultant, Dermatology shares some tips to help protect your skin during Holi. their grooves and it's almost impossible to get them squeaky clean after. Use a lip balm to protect your lips from getting stained. Use organic colours to keep your skin safe from the harmful chemicals in artificial colours. Not only are organic colours more skin friendly, but they are also more environment-friendly!